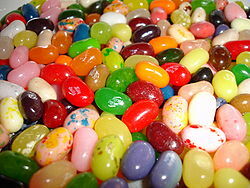 Up to Speed: Jelly Belly's! I think it would be really fun to take their factory tour. I love factory tours in general. But they are up near Sacramento. Not very close to anywhere I go. Meanwhile, I will continue to enjoy them as a treat. If you haven't tried them in a while, give them a try! They are magic beans. You had me until you called them magical beans. I grew up with my brothers singing "Beans, beans, the magical fruit . . . "
I sometimes buy online for the special ones or special occassions. I think they are fun as well as good ! I have a video tour of the factory. (A perk of teaching school!) You are welcome to borrow it if you wish! !